Finland's Melodic Power Metal band Burning Point have a new self titled album out. It is however new in more ways than one because band leader and guitarist Pete Ahonen has stepped down as Burning Point's lead singer, with the task of filling his rather big shoes given to ex-Battle Beast vocalist Nitte Valo. 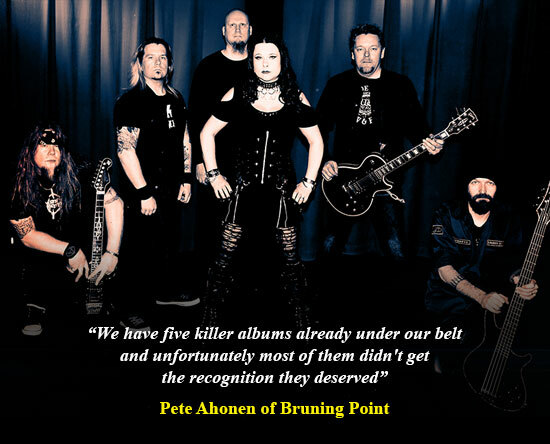 Ian Johnson speaks with Pete and asks what the reasons behind this decision were, how things have worked out for the band since changing from a male to a female singer and what's next for this group of Finnish Warriors. The question I and all the fans of Burning Point will want to know the answer to first, is why have you stepped down as lead singer for the band? Was there a problem with your voice? No, nothing like that. I just felt we were at some sort of crossroads, you know? We either continued like it was and try to make the best of it or we had to try to add some extra vitality and boost things up. I think it really did that. Why then go with a female vocalist? Burning Point has always been a male preserve so what made you choose Nitte Valo? Did you audition men as well as women or did you always have a female singer in mind when you decided to step down as the band's vocalist? Well, the funny thing is that even though Nitte is clearly a woman, I never actually thought of it that way; male or female. She was basically my first and only choice. I remember the first time I heard her voice on the radio, as they played a Battle Beast song, and I thought, "WOW! What a great voice that dude has" ha,ha,ha,ha! Why did you decide to do an album that was half old songs half new ones? Why not a full new album? Was doing it this way easier for you to introduce Nitte to the fans as the band's new singer? We decided to re-record some older stuff firstly because we now have the perfect label behind us (AFM Records), who have a huge marketing/promoting base. That way we can introduce our past to an even wider audience, whilst also bridging the gap to the new. We have five killer albums already under our belt and unfortunately most of them didn't get the recognition they deserved, mainly due to lack of promotion, etc but now it's full-speed ahead. AFM are actually re-issuing them with some really nice extras too, so I think doing a half and half is justified. Although, I agree that maybe it is easier doing it this way to present Nitte to our old fans through our old songs?" Nitte brings a different sound and outlook to the older songs you've re-worked for the album. You must be really happy with how they turned out with a female vocalist singing them? Oh yes, very! We first tuned up the guitars a half step but in the end we did very little tinkering with the arrangements of the older songs. I changed the solo part on "Dawn Of The Ancient War", removed a few parts from the track "Heart Of Gold" and so forth, but basically they are pretty much the same as the originals... With soooooo much more on top! Were the new songs on the album written specifically for Nitte or were they songs written for you that you then re-jigged for her? "Queen Of Fire" is actually the only song I wrote after Nitte joined the band. I thought it would be really cool to write some kind of "battle song" for her, you know? Epic lyrics combined with an epic and pompous song in the vein of Manowar etc. The other new tracks just happened to fit her voice perfectly. Is this just an interim album that you will follow up quickly with an album of new songs? Well, although half of the songs are re-recorded older songs, we still poured our heart and soul in to this album. It's been done as if it was a totally "new" album. But yeah, we've already written an album full of new songs and we're planning to start the recordings before the summer is out. Hopefully it'll be released in spring 2016! When and where will you be showing Nitte off to the band's fans? Well we're definitely playing shows here in Finland; a few festival and club gigs are already confirmed, but an actual tour? Well, we are ready, willing and able for sure but these things always comes down to money in the end. We hope we'll get the support and get to play outside Finland; so a few shows for now and hopefully then a lot more after the next album. Talking of your fans, have you had any response, either positive or negative, to your stepping down and Nitte taking over as the band's singer? 99% have been very, very positive, but of course there are a few fans that are not that happy with me stepping down. You can't please everyone and it is not our goal to do that. We make the decisions as a band and in a way we feel it was the right thing to do. Does it feel like a weight off your shoulders just to play guitar now or will you still sing some of the songs when you play live? In a way it is, yes. Some of the older songs are quite challenging whilst having to play guitar and do vocals at the same time, but there might be some songs which I will still sing live; we haven't discussed any details as yet really. It would be cool to still sing though. What's next for Burning Point? With Nitte does this feel like a new start and new chapter in the band's story? Hell Yeah! We are always excited when a new album comes out or we're playing live, but now the "hype" and the energy inside the band is at its peak! There is a great past behind us and an awesome future ahead!